Fireboard-800™V.3 is Unibrain’s new 1394b 64 bit PCI OHCI adapter and is based on the two main chips of Texas Instruments, TSB82AA2B (1394b OHCI-Lynx Controller) and TSB81BA3D (three-port bable TRANSCEIVER/ARBITTER PHY chip). 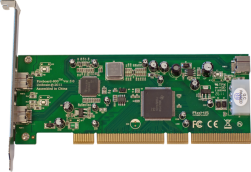 Fireboard-800™ is a 64bit PCI OHCI Host Adapter capable of exceptional 800Mbit/sec performance, providing the throughput and bandwidth to move data efficiently and quickly between the PCI and 1394 bus. This board also provides outstanding ultra-low power operation and intelligent power management capabilities, being compliant with all the latest 1394, OHCI and PCI specification/standards. Fireboard-800™ operates as the interface between a selectable 64-bit 33-MHz or 32-bit 33-MHz PCI Local Bus and a compatible 1394b bus. Its PHY-layer device is capable supporting serial data rates of S400 and S800. Windows XP/Vista/7/8/10 32/64 bit, Windows Server 2008/2012. Fully-Compliant), Bilingual 1394b, 9 pin ports with screw lock cables support. Internal ‘big IDE’ 4 pin power connector. 3.3V and 5V PCI bus signaling. PCI burst transfers and deep FIFOs to tolerate large host latency. Operating Temperature: 0~65′ C, Storage Temperature: -20 ~ 90′ C.
Operating Humidity: 0 ~ 80% RH, Non-condensing. Fireboard800-e™ V2.0 can connect up to 63 IIDC firewire digital cameras in a peer-to-peer topology. Using Unibrain’s Fire-i™ Software you can connect up to 63 firewire cameras and simultaneously control and display up to eight (8) of them, thus providing an advanced interface solution for machine vision, security, GPS mapping and other professional applications. You can connect a multiple array of external FireWire devices such as CD-R/W or DVD drives easily. Just plug-in any SBP2 FireWire External Hard Drive to the installed Fireboard800-e™ adapter and immediately add storage to your PC. Unibrain’s Fireboard800-e™ has been thoroughly tested to operate seamlessly with Unibrain’s entire range of External FireWire Hard Drives as well as any third party external storage devices. Simply connect any DV or HD-DV camcorder to your PC or Mac via Unibrain Fireboard800-e™ Host Adapter. Capture, produce and share your digital video, with any digital video application fast and seamlessly.